SHSU students on last summer's art expedition to Florence, Italy survey the city's architectural styles. 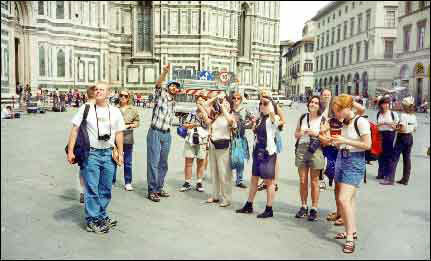 The summer '99 Florence trip will earn participants a three hour credit in ART 493: The History of Italian Art. Courses in Italian art and European business will round out Sam Houston State University's busy summer 1999 study abroad line-up. The three-hour "History of Italian Art" course features a 21-day stay in Florence, Italy with side trips to Venice, Pisa, Lucca, Assisi, Arezzo and Rome. 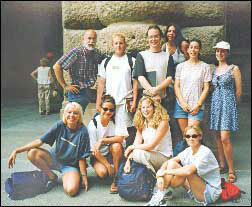 Intrepid SHSU travelers pause for a group photo during a summer '97 trip to Florence. The art classes will be conducted, when possible, at museums and among buildings and public spaces where some of the greatest artistic masterworks of the western world can be found. The course canvasses the history of Italian art beginning with prehistoric cave drawings and continuing through Roman, Byzantine, Renaissance and Baroque periods to modern times. Coursework will be supplemented by an intense, art-rich itinerary. "It is a transforming experience," said Darryl Patrick, the SHSU art professor leading the trip. "Students will walk among monuments of the ancient Roman world, float down the canals of Venice and view palaces and churches they have only dreamed about." The course costs $3150 plus first-session summer tuition fees. The funds pay for round-trip transportation from Houston, all course-related transportation in Italy, an apartment in the historic center of Florence, guides to all artistic travel sites and travel insurance. An early registration fee of $300 ($400 after Dec. 15) will hold a spot in the class. All fees must be paid by March 15. For more information on the Italian Art History course in Florence contact Patrick at (409) 294-1561 or visit the ART 493 web site. Plans are still being drawn for a French and European business course which includes studies this summer at Clermont I, a business school in Auvergne, France. The course will be offered through SHSU's business and French departments as "GBA 430: Orientation to French Business" and as "FRN 475: Problems in Business (Special Topic: Individual French Readings)." Because the Clermont I courses will be conducted entirely in French, only students with fluency in the language will be considered eligible, explained Charles Stowe, an SHSU business and finance professor arranging the course. He is also director of SHSU's office of International Programs. Under the terms of the agreement with Clermont, Stowe said, SHSU will facilitate academic internship opportunities for French business students in exchange for SHSU student acceptance into the Auvergne institution. The SHSU students will actually begin course work in Huntsville before making the trip to Auvergne. "Clermont has a fabulous setup," said Stowe. "They have dorms and cafeterias subsidized by the French government so housing and meals are cheap. Otherwise, France is far beyond affordable to the average student." Dates and costs for the French program are still being worked out, but queries are welcomed. Stowe can be contacted at (409) 294-1287.